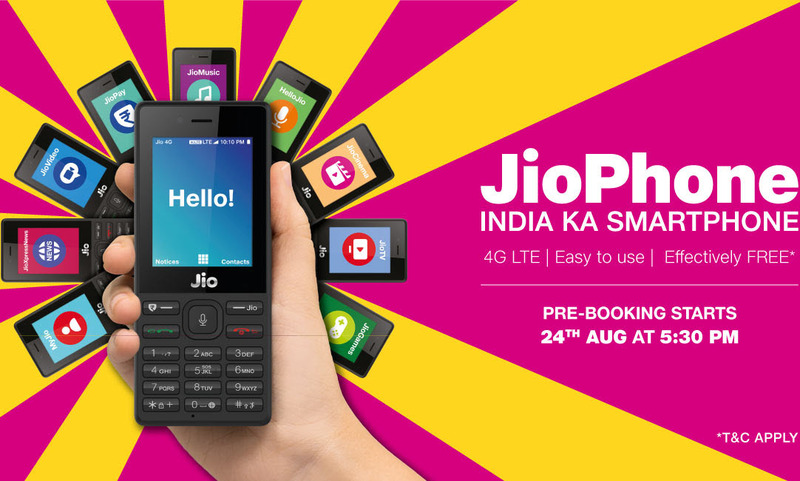 The Jio Phone Pre-Booking will be live today at 5:30 PM [24th August 2017]. The phone is technically free of cost but you have to pay a security money of Rs.1500. The amount of security is fully refundable after 36 months by handover the phone. At the time of booking you have to pay Rs.500 and the rest Rs.1000 at the time of delivery. The Jio 4G VoLTE feature phone booking starts at 5:30 PM on 24th Agust, 2017. Anyone can book the phone by paying Rs.500. You can also book Jio Phone on behalf of others. The delivery of the phone will be starts from September 2017 as first come first serve basis. The Jio Phone can be book through Online and offline both. Online booking can be done via Jio official website- jio.com and also via MyJio app. And Offline booking can be done through local JioStores and Jio retail stores. 4) Complete the booking process by paying Rs.500, done booking after successfully making the payment option. 5) After booking the phone, you will be notified through SMS. 1) When do Jio Phone booking starts? Ans: Jio Phone booking starts on 24th August 2017 at 5:30 PM. 2) From where do I book Jio Phone? 3) What are documents required to book jio phone? Ans: Nothing so far, just need to enter name, phone number and pin code. 4) Is Jio Phone free? Ans: Yes, Jio Phone is essentially free but you have to pay Rs.1500 refundable security deposit. 5) Do I have to pay security money at the time of booking? Ans: Yes, you have to pay Rs.500 at the time of booking, rest while receiving the phone. 6) Delivery date of Jio Phone? Ans: Delivery of Jio Phone will be starts from Septer 2017 as first cuome first serve basis. 7) Can I book Jio Phone for other too? Ans: Yes, you can book Jio Phone on behalf of friends or family by paying the booking money. Jio Phone is primarilly aimed for those people who can't afford costly 4G VoLTE supported phone. With just Rs.1500 security deposit anyone now can own a 4G phone. Jio Phone pre-booking will starts just after few hours from now. So keep your details ready, ready to pay Rs.500 booking amount and wait for it. The more quick you will start booking the more you will get chance to early delivery of the Jio Phone.